Once again, read between the lines, and the latent presence of chess in this clip is hard to miss. Another Wacky Wednesday doubleheader, kids. These two games are so short they give new meaning to the term miniature. Because they’re so short, I’ve posted both of them; it would have seemed stingy to give you only one. The blunders seem self-evident, making commentary unnecessary. In both games Black White resigned after the last move shown. Okay, one comment: Notice how in this game, Black's failure to develop properly meant the loss of his or her queen was imminent. Hence the resignation. GM Joel in ecstacy. Or is it really Glenn Panner? I’m actually a fan of former U.S Champion Joel Benjamin, but this shot of him seeming to space out at the U.S. Open two years ago, taken by a Chicago chess dad who’s also a great photographer, was too good to pass up. This clip hardly needs commentary, though I would point out that one of the hidden subtexts of the speech is obviously chess. Can you spot it? When we learn about chess, we learn about tactics, don’t we kids? Those great maneuvers like forks, pins, skewers, and discovered attacks that not only win material but are jolly-good fun to spring on our opponents. The trouble is, those of us at the subterranean levels of chess skill seldom get to use those tactics, because our “board vision” is poor, and we can’t see the tactical patterns in our games. That’s certainly one of my biggest problems. By some miracle, however, I saw one good tactic in this five-minute blitz game, which I won on time. It came to me like a bolt from the blue, possibly through the grace of Caissa. Not that it was great game; it wasn’t. Getting pawn-forked with 11. e5 was unfortunate, to be sure. And of course I should have played 8. … Nxc4, instead of castling. Duh. Sometimes chess is fun even for those of us who aren’t very good at it. It wasn’t the best of times, it wasn’t the worst of times; for the Ray School chess squad it was somewhere in between at yesterday’s tournament at the Julia Ward Howe School on the West Side, organized and directed by the Youth Chess Foundation of Chicago. Ray’s Sonam Ford and George Vassilatos did win trophies at the sparsely attended meet, though the big winner of the day was Coach Trevor Scott’s Disney Magnet School, which won the team competition as it has so many times in the past year. Disney may now have eclipsed Burbank as the dominant elementary school in the Chicago public schools. Peterson Elementary’s Jace Miyagi won the intermediate division, and top honors in the beginner’s section went to Justin Buschnyj of Burley School. The tournament’s overall champion was Brandon Truitt of Burbank, who won the advanced section, though not before Sonam spoiled Brandon’s perfect score for the day by beating him in a thrilling final-round game. Sonam finished in second place overall with 3.5/5. George’s 4.0/6 gave him an eighth-place finish and his second trophy this year in the beginner section. More photos here; complete standings here. Penn historian Alan Charles Kors sums it all up for our short attention spans. Hat tip: Andrew Sullivan. You’re in for a treat, kids, for today we have not one, but two Wacky Wednesday games for the price of one. And when you consider that said price is zero, well—such a deal! The reason for the twofer is simple: Since I will first show you a game in which I went down to ignominious defeat, I'd like to balance it with another in which I soared to ignominious victory. If that last term sounds like an oxymoron, just wait till you see the game, and all will be clear. This was quite a neat little trap, the likes of which I hadn't seen before. 1.e4 c5 2.Nf3 Nc6 3.d4 cxd4 4.Nxd4 Nxd4 5.Qxd4 Qc7 6.Nc3 e6 7.e5 A weak move. 7. Nb5 attacking the queen would have been better. Here again 8. … Nb5 would still have been good. Exchanging queens would not have been good for Black, since it would result in a knight fork on the king and rook. Black would lose the ability to castle and at least an exchange if not a rook. A blunder that fails to take account of the zwichenzug to come. Ne4 protects the f2 square and attacks the bishop at the same time. All is lost. 10. Kd1 keeps White’s hopes alive. Duh. A blunder, of course, called hanging a piece. My only excuse is that everyone does it sometimes. Not much of an excuse, is it? Sometimes the sequence of captures matters. Here I win back the piece I blundered away earlier by capturing the bishop instead of the knight. Consider what the reverse would have brought me. Yes, yes, I know: 15. Qxe7#. I see it now, all right? Don’t rub it in. Nothing from Polly yet at this hour. Have you ever been to a chess shop, a place where you not only buy chess equipment, but actually see it, fondle it, and make sure it’s what you want before you pay for it? Where you can frolic amid shelves, even aisles, of gorgeous chess sets, admiring the ones you could never afford, and drooling a bit perhaps before moving on? Where the proprietor actually plays chess, knows the game, and will kibitz with you whether you buy anything or not? If you live in Chicago, you may never have set foot in such a place, for there isn’t a single chess shop in the city. There are more chess shops on one block of Greenwich Village, in fact, than in all of Cook County, Illinois. As far as I know, the only chess store in our entire area is out in Elmhurst; Thompson Street between 3rd and Bleecker in New York has twice that many. But for how long? According to the New York Observer, the neighboring Village Chess Shop and Chess Forum, mainstays of the city’s chess scene for years, as much for their perpetual feud as for the equipment they supply to local woodpushers, are struggling to survive. “We are en route to vanishing,” said Chess Forum’s Imad Khachan, and the reason is simple: the Internet. With chess supplies as for other commodities, online retailers enjoy low overhead and can sell for less. The last time I was in the Village Chess Shop, a regular set of plastic tournament pieces cost about twice what it cost at Wholesalechess.com. So once again we face the question of what the Internet is doing to chess, and is it good or is it bad or is it some of both? The Internet adds efficiency to commerce, lifts out costs, and reduces prices. All good. But something is lost. The kind of culture that thrives around the commerce of Thompson Street, the Shakespeare talk and all the rest, is a stranger to electronic commerce. Nu? Where besides the Village do bricks-and-mortar chess stores survive? There’s the American Chess Store in Austin and Your Move in Massapequa. Where else? After the first three games of her four-round match with Armenian Women’s Champion IM Lilit Mkrtchian ended in draws, U.S. Women’s Champion IM Irina Krush pulled out a victory last night in the final game at the Skokie Holiday Inn. See it here. I guess that means she wins the match, right? For K-8 kids rated 500 or above, IM Angelo Young is holding his fourth “Scholastic Chess Tournament of Champions” at the Touch Move Chess Center, 5639 North Ashland, Chicago, tomorrow. Call (773) 627-2759 for details. 3 divisions: Beginner, Intermediate, Advanced. Details here. The Ray School Chess Club will attend this tournament, so parents: please let me know if your kids would like to play. This Sunday’s previously scheduled tournament at the Hyde Park Neighborhood Club from Chess Education Partners has been cancelled. P.S. This my 200th post on this blog. Yeah, I know: Who cares? I wondered if this game was wacky enough for Wacky Wednesday, but at least it has the virtue of being short, and when one is on a self-imposed deadline one relaxes one's standards. Black ran out of time here, but according to the Crafty chess engine, even with time on the clock, White wins with 19. . . . Rxe1+ (probably the only move that can prevent 20. Qxh7#) 20. Rxe1 Qxf2 21. Kxf2 Rd8 22. Qxh7+ Kf8 23. Qxf7#. P.S. For more Wednesday wackiness, don't miss That 70s Show at Polly's blog. Chess tournaments abound in the Chicago area, but matches, those psychological dramas where two strong players face one another over the board, over and over, in a series of hard-fought games: that’s something we don’t see around here very much. While only two can play in a chess match many can spectate, and through the miracle of MonRoi, millions can follow a game and even kibitz about it online while it’s underway. This week we have a chance to watch two national champions fighting it out up at the Holiday Inn in Skokie. U.S. Women’s Champion and major chess celebrity Irina Krush (top photo) is facing Armenian Women’s Champ Lilit Mkrtchian. The first two games ended in draws; there are two more games, one Wednesday and the other Thursday evening, each at 5:00. You can go and watch in person or follow it online. Details here, and initial report from Betsy here. This is a rare opportunity; don’t miss it. 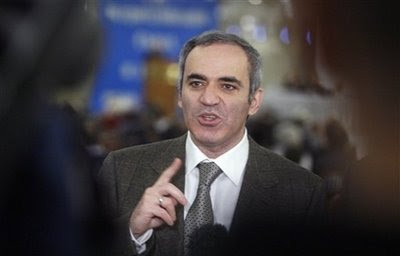 In a stunning development that has sent shock waves through the capitals of the world, the Supreme Court of Russia has overturned the country’s recent presidential election and named former World Chess Champion Garry Kasparov Russia’s new head of state. The court’s decision represents a 180-degree reversal of the original election, which installed Dmitry Medvedev as the hand-picked successor to Vladimir Putin. Though doubts about the integrity of the election were widespread outside of Russia, calls for greater openness fell on deaf ears, and Putin’s grip on the country’s institutions appeared solid. That solidity began to unravel, however, when it was learned that the voting machines used in the election were the same ones used in Florida for the U.S. presidential election of 2000, and that the vote count in Russia had been secretly overseen by former Florida Secretary of State and Bush campaign official Katherine Harris. The revelations created a scandal that quickly devoured the country's ruling elite. 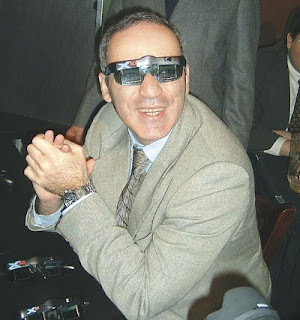 Kasparov, who was a declared candidate for president, even though his name wasn’t on the ballot, immediately took the oath of office and moved to consolidate power and reform the country. To motivate citizens of the world’s largest nation, he ordered copies of his recent book, How Life Imitates Chess, air-dropped in large quantities onto Russia’s major cities. He sent Moscow police to raid the hookah club reported to be operating in the basement of KGB headquarters. 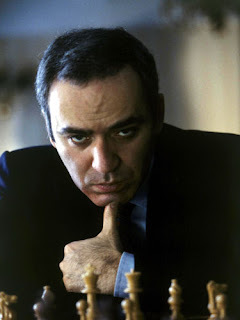 To quell jittery financial markets and prove that he was in control, Kasparov took to the airwaves his first night in office and delivered a nationally televised lecture on the Sicilian Najdorf. And in an attempt to inject vitality into the ossified Russian chess establishment, Kasparov appointed the young Grandmaster Alexandra Kosteniuk to Commissar of Chess. 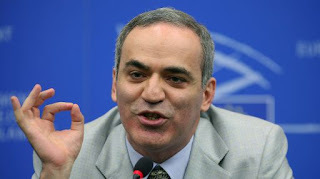 Sen. Barack Obama said he hoped Kasparov could bring much-need change to Russia. He invited the new president to Chicago and his Hyde Park home, promising to introduce the former world champ to the chess hustlers outside Starbucks and at the 53rd Street Borders. Sen. Hillary Clinton expressed doubts about whether Kasparov had been fully vetted and wondered if he had the experience to be commander-in-chief of Russia on day one. “You mean when I make a call to the Kremlin at 3:00 a.m., a chess player’s going to pick it up?” she asked. Presumptive Republican nominee Sen. John McCain said the volatility in Russia proved that we must keep American troops in Iraq for a hundred years. “Make it two hundred,” he added as an afterthought. FIDE President Kirsan Ilyumzhinov, who’s now in the awkward position of having Kasparov as his boss, could not be reached for comment immediately, though a spokesperson in Elista said the president of the Kalmykian Republic was “conferring with his space chums.” Western diplomatic sources said this was code, interpreting it to mean that Kirsan had undergone another alien abduction. 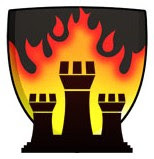 In New York, chess blogger Elizabeth Vicary called Kasparov a “right winger,” prompting angry denunciations from Boston Blitz Manager Matt Phelps, who said her USCL Blogger of the Year Award should be rescinded. Phelps was soon joined by Blitz players Chris Williams and Ilya Krasik for a torrent of online invective. League Commissioner Greg Shahade appealed for calm, but at last count there were 618 anonymous comments on the blog thread, not counting 277 profanity-laced messages that had been removed by Vicary’s cats, who serve as the site’s administrators during the day, while she’s off teaching at Brooklyn’s I.S. 318. Having rooted out corruption and put the machinery of reform into high gear, Kasparov repaired to his dacha in the country with Greengard to begin work on his new book about recent Russian political history. Tentative title: My Lousy Predecessors.